September due dates will soon be here. October due date is coming for individual income tax returns. Gifts from non-resident aliens can be subject to U.S. Gift Tax. California enacts an earned income tax credit. Property tax appeals filing deadline is coming. 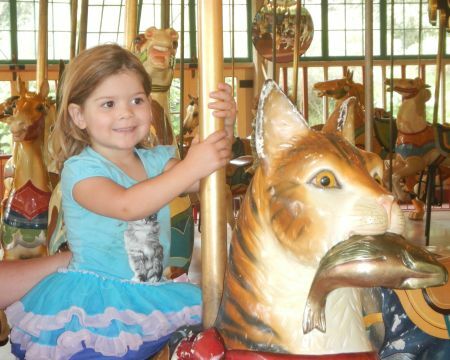 Minerva Siemer on the carousel at the San Francisco Zoo. Classes will be starting soon for most of the schools in our area. My grandkids tell me not to say the "S" word! Be careful as children become accustomed again to traveling to and from school. My granddaughter, Minerva Siemer, celebrated her third birthday this month. My wife Janet and I celebrated our 44th wedding anniversary this month. Janet has certainly been a blessing in my life and I feel very fortunate to have married her. Janet's sister, Gail Johnston, is celebrating a birthday this month. The extended due dates for calendar-year corporations, partnerships and trusts is September 15. Be sure to get the information for your extended return to your tax return preparer right away. If you need us to prepare your tax return, call Dawn Siemer on Monday, Wednesday or Friday at 408-918-3161 for an appointment. The third quarter federal estimated tax payment due date for individuals, calendar-year trusts and most calendar-year corporations is September 15. California doesn't have a third quarter estimated tax payment due on September 15 because the first two payments are "front-loaded." In some cases, taxpayers will "catch up" on unpaid California estimated tax payments on September 15. In case I get snowed and don't get out an October newsletter before October 15, remember that is the due date for extended individual income tax returns. Get the information to finish your tax returns to your tax return preparer right away. If you need us to prepare your tax return, call Dawn Siemer on Monday, Wednesday or Friday at 408-918-3161 for an appointment. President Obama signed the Surface Transportation and Veterans Health Care Choice Improvement Act of 2015 on July 31, 2015. Effective for tax years beginning after December 31, 2015, the initial due dates for income tax returns of partnerships and C corporations will be changing. The partnership due date will change from April 15 to March 15 (or 2 Â½ months after year-end). The due date for S corporations will be unchanged at March 15 (or 2 Â½ months after year-end). The due date for C corporations will change from March 15 to April 15 (or 3 Â½ months after the year-end), except the due date for C corporations with tax years ending on June 30 will keep the September 15 due date until tax years beginning after December 31, 2025 when it will become October 15. For years beginning after December 31, 2015, the due date for the FBAR (Report of Foreign Bank and Financial Accounts) will be changing from June 30 to be the same as for individual income tax returns, April 15 with an extension available to October 15. For information returns due (without regard to extensions) after December 31, 2016, mortgage servicers will be required to include more information on Form 1098, the annual mortgage interest statement. Effective for all returns for which the normal assessment period remained open as of July 31, 2015, the statute of limitations has been extended to six years when there is an overstatement of basis resulting in an overstatement of income exceeding 25% of gross income stated on the return. This legislation overturns the Supreme Court decision in Home Concrete, 2012-1 USTC 50,315. Executors of large estates that are required to file estate tax returns after July 31, 2105 will be required to report to beneficiaries the value reported on the estate return for property they receive. The date of death value reported on the estate tax return will be controlling for determining tax basis of the property when it is sold by the beneficiary. Effective for months beginning after December 31, 2013, an individual won't be accounted for as an employee for large employers for required shared responsibility health care payments if that individual has medical coverage for the month under a program for members of the U.S. Armed Forces (TRICARE) or a VA health care program. I recently attended an estate tax planning symposium. One of the speakers reminded us that nonresident aliens (individuals who are not U.S. citizens and live outside the U.S.) can be subject to U.S gift tax when they make gifts of real estate or personal property located in the United States. There is no exclusion except for the annual $15,000 exclusion per donee, per donor. We most often see this for gifts of real estate. Cash can also be personal property. It's best that transfers of cash be made outside the U.S., such as by opening a bank account outside the U.S. (which will also be subject to foreign bank account reporting, but not U.S. gift tax). Gifts exceeding $100,000 (cumulative for the year) also have to be reported by the donee on Form 3520. If a nonresident alien wants to make a gift to a U.S. person, he or she should get professional advice from a tax advisor familiar with the rules. California has enacted a new earned income tax credit effective for 2015. The amount of the credit will depend on a percentage stated in California's budget act. The California credit will be computed by multiplying a modified federal credit amount by an "adjustment factor". For 2015, the factor is 85%. For the California credit, "earned income" will not include self-employment income. Earned income will be employee wages. The credit will only be available for individuals who have a qualifying principal place of abode in California more than half the year. The credit is phased out at fairly low levels of gross income. The deadline for filing appeal for a California property tax appeal in Alameda, Inyo, Kings, Orange, Placer, San Francisco, San Luis Obispo, Santa Clara, Sierra and Ventura counties is September 15, 2015. The deadline for other counties is November 30, 2015. September 4, 2015, Janis Carney, attorney at law, Carney Elder Law, "Paying for long-term care for seniors in California"
September 11, 2015, Robert E. Temmerman, Jr., attorney at law, Temmerman, Cilley & Kohlmann, LLP, "I'm an executor. Now what?" September 18, 2015, Robert E. Temmerman, Jr., attorney at law, Temmerman, Cilley & Kohlmann, LLP, "I'm a trustee. Now what?" September 25, 2015, Peggy Martin, ChFC, CLU, The Family Wealth Consulting Group, "Legacy planning"